We are surrounded by them. When we are afraid and need help, we just need to ask God to open our eyes. When God opened Elisha’s servant’s eyes, he saw that the hills around them were filled with the Army of God. God promises the same to us. He is always with us and his army is ready to go to battle for us. Sometimes they are already in the midst of a battle for us and we just don’t know it. Other times we know it. When our lives are really messed up with conflict everywhere we turn, we can stand firm. We know God and his army are fighting for us. Sometimes things happen that are clearly an attack of Satan. A couple of years ago in my office several very weird things started happening and mean, name-calling emails started flying around from ‘anonymous’ sources. In the midst of it, Satan showed me very clearly that he was behind it all. This was his plan. He thought he was taking charge. Somehow, the fact that Satan was so blatant about it made it easier for me to remember that the battle was God’s, not mine. And God worked it all out for my good – just like he has promised. 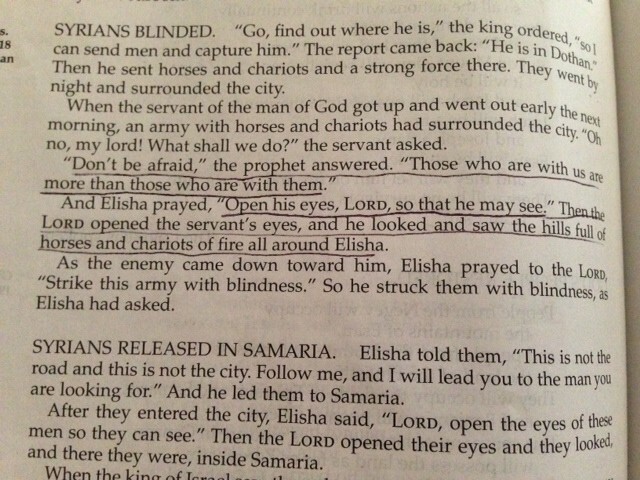 God and his army stand ready to defend us – we just need to open our eyes.